17 Dove Street: Tee Shirt Sale! I had a very busy weekend and haven't had a chance to edit my photos yet, so look for my weekend post on Tuesday. 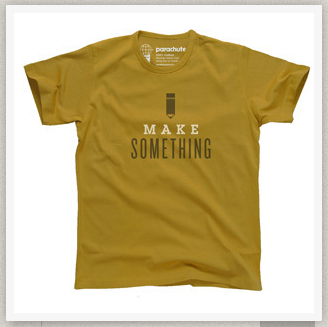 In the meantime, I wanted to pass along the news about an awesome tee shirt sale! 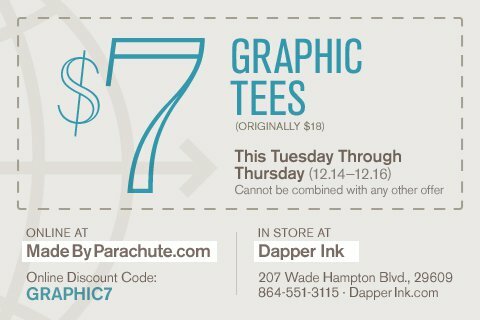 My friends at Dapper Ink have recently launched their own clothing line, Parachute, with designs by the oh-so-cool Andrew Ramos. To celebrate the launch, they're offering a crazy awesome sale. If you're in Greenville, stop by their retail location (next to Community Tap on Wade Hampton Blvd.) or drop in the virtual store at MadeByParachute.com. This is my favorite design so far, I'll be definitely be scooping one up.